5 years ago I hit publish on a blog post for a recipe I was pretty lukewarm on. As evidenced by the fact that I didn't make it again for 5 years. These days I'm constantly searching for something new to make for dinner thanks to the fact that I eat a ton (thanks breastfeeding) and so does Michael and now little James. 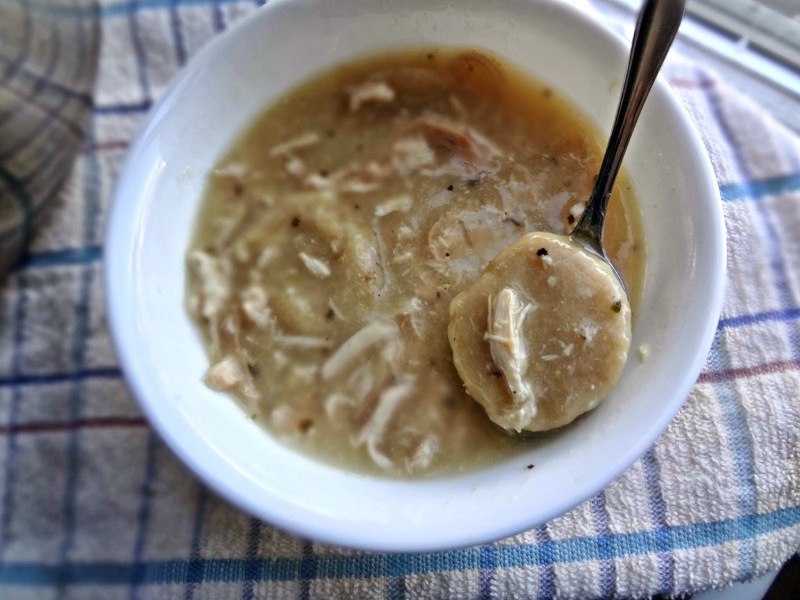 So I unearthed the chicken and dumplings recipe I'd made so many years ago. And decided to try making it in the slow cooker. And it was awesome. Michael loved it, I loved it, James loved it. So now the internet should love it too, right? It's creamy dreamy comfort food: perfect to warm you up on these cold January evenings. And using a slow cooker makes it even simpler to make. Put chicken, broth, and seasonings in a slow cooker and cook on low for about 8 hours. Skim any fat/scum off of the liquid and discard, along with the bay leaves. In a medium bowl whisk together flour, 1/2 tsp. salt, and baking soda. Stir in melted butter and buttermilk. Place on a lightly floured surface and roll out to about about 1/8" thickness. Cut out 2 in. shapes (or just tear them off). Plop dumplings into crockpot and put on the lid, cooking for 20 minutes on high. Stir occasionally. Add shredded chicken and stir until combined. Serve warm! Store leftovers in an airtight container in the refrigerator for up to 5 days.